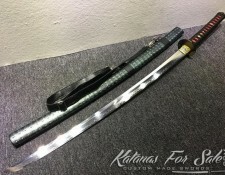 In this guide we will explain how to properly maintain your Katana sword and preserve it to last for long time, proper Katana maintenance is very important and if not done properly, your sword will rust, and eventually become unusable. 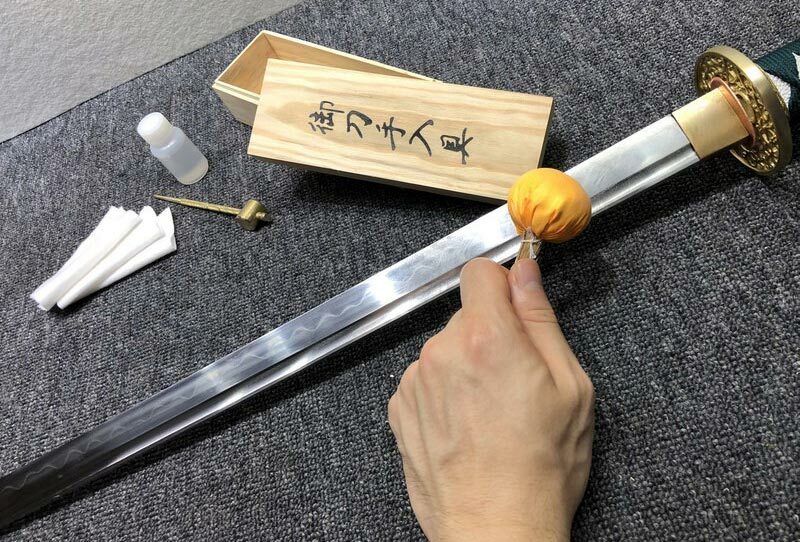 It is vital to keep the sword oiled and cleansed every time you decide to use it for test cutting, how often you should oil the sword depends on the climate in your area. 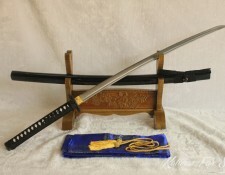 A Samurai is attached to his sword. 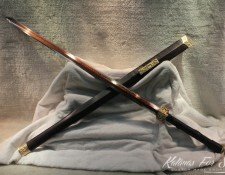 This deep affinity has something to do with a warrior’s code of Bushido. 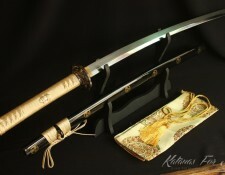 The samurai and his sword cannot be separated from each his “soul”. 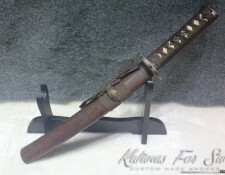 Even when a young samurai was born one of the momentous parts of this life would have his sword brought into the bedchamber before he enters the world. 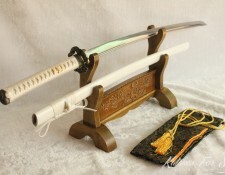 During death, old samurais need their sword beside them to “cross-over” into the White Jade Pavilion of the Afterlife. 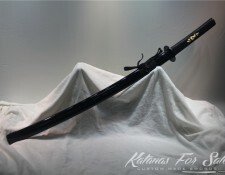 A nobleman warrior counts on this katana to be with him even after death to guard him against demons. Sheets of Nuguigami or soft cotton cleaning cloth. 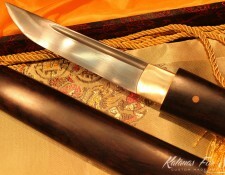 Choji or Mineral oil – This will prevent the blade from getting rusty. Most of the time the use of choji or mineral oil with a small dash of camelia oil will do the trick. If in case these mineral oils are not available; the use of oils used in other weapons, sewing machine may act as substitution. Quick cleaning is immediately needed after performing tameshigiri. Cleaning the blade will help it avoid acquiring corrosive residue. Prepare all the needed materials. Use a wiping cloth to apply the choji oil. Make sure that is saturated with choji oil. 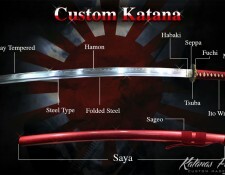 Remove the blade from the saya. 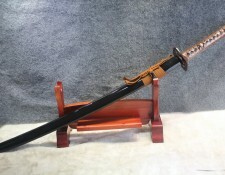 The sword is held edge up. 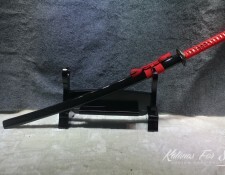 Blade must slide on the mune. The kissaki must point slightly upwards. Tap the debris from the saya. 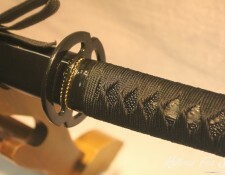 Do this gently since the horn ring on some saya tend to fracture. 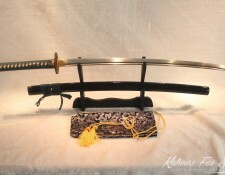 Use the wiping cloth once or twice on the blade. 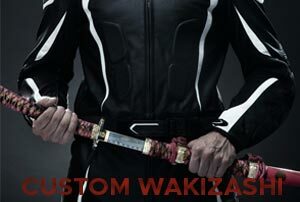 Avoid putting too much oil on or under the habaki or blade collar. 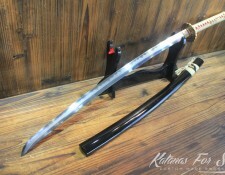 It is important to immediately clean the sword after tameshigiri or test cutting after the class ends. 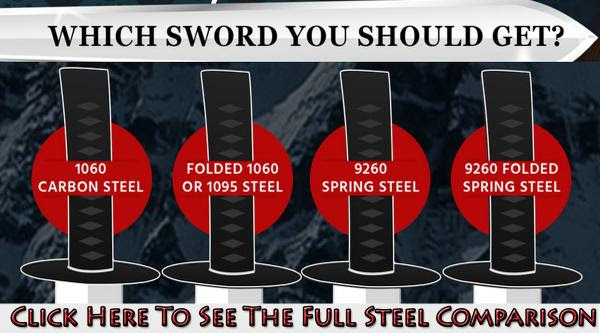 The truth is that real swords are made of carbon steel and if not maintained properly they rust. 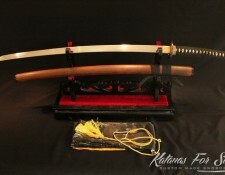 The blade must be clean immediately when it is touched. 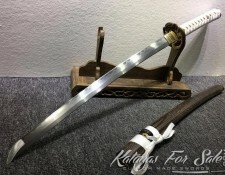 Swords of any type just like the katana needs to be protected from rust and corrosion. 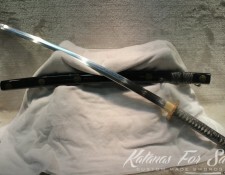 Because of its mirror like surface, this Japanese sword needs a little more care and special equipment when cleaning. 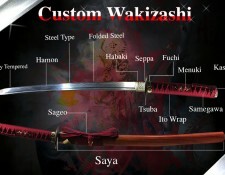 If dirt and oil or even water builds up in the saya or scabbard, this can damage the blade quickly. 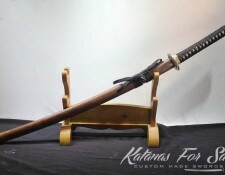 Wooden saya needs to be replaced over time. 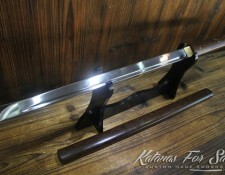 Wooden made saya soak up the oil film from the katana during storage. 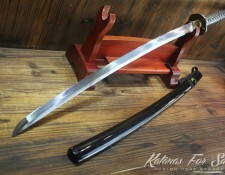 Aside from regular cleaning, a katana must be cleaned and oiled after each use. 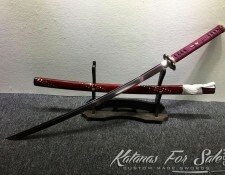 How Often a Katana Must Be Cleaned and Oiled? 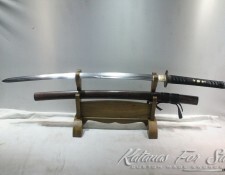 In a dry area, a katana stored the right way needs a change of protective coating every three to four months. In humid locations, cleaning should be more often. Since oil normally wears off over time it need to be replenish. Moisture can build up inside the saya. 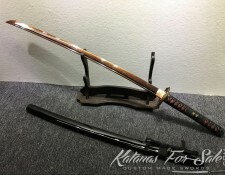 This will increase the risk of rust in the blade. 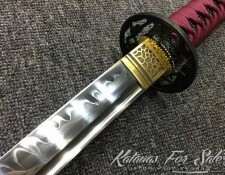 There are things that must be kept in mind when cleaning a katana. Never use harsh cleaning or polishing chemicals since this might damage the surface of the blade. Chemicals can cause corrosion and rust. Do not use abrasive sharpeners or grinding wheels. 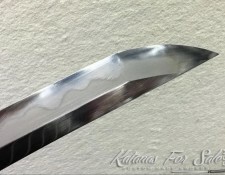 If there is no Japanese water stones for sharpening a katana inexperience or lack of training can easily destroy the blade. Avoid holding the blade with fingers when applying oil. 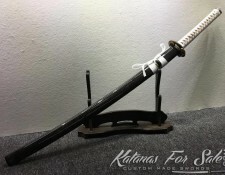 Use clean cloth instead to hold the blade. 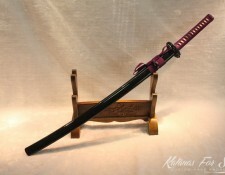 This is safer and protects the blade from fingerprints. 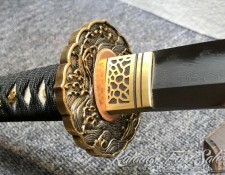 These prints can cause rust to form when the blade is stored especially for a long time. 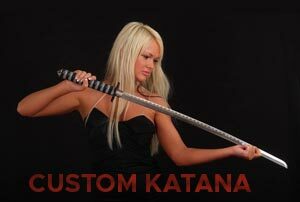 Never clean a katana when distracted. A sharp blade can draw blood and cause injury or even wounds no matter how minor these are. 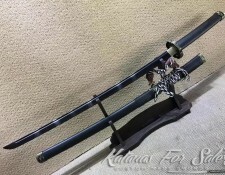 Store the katana at an angle or vertically to avoid the protective oil from getting into the tip. 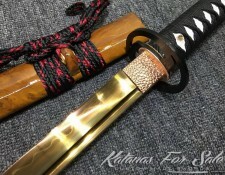 Do not store the katana in extreme hot or cold temperature. 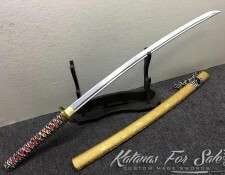 This can damage the saya and blade. 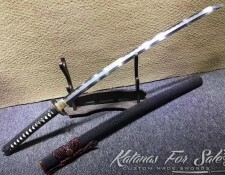 From the earliest records in Japanese history, exceptional quality Japanese swords makes them admired and prized by their owner. 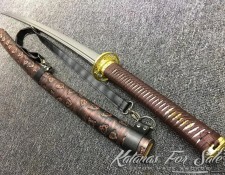 These katana are cherished works of art; not just as weapons of war and destruction. 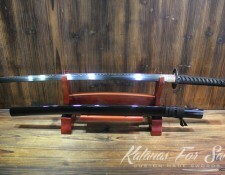 When daimyos or Japanese lords meet they would often admire each other’s sword even those that belong to their rival. 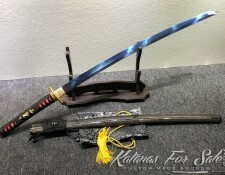 Those who were once arch enemies like Toyotomi and Tokugawa have forged their newfound alliance by presenting a sword. 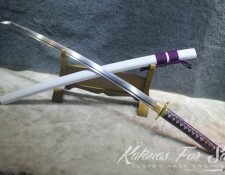 Toyotomi gifted his arch-rival with a sword crafted by the legendary swordsmith Masumane. Respect for the sword means passing it on from generation to generation; from father to son. 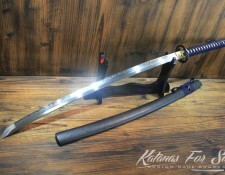 Due to normal wear and tear swords that are broken are repaired. 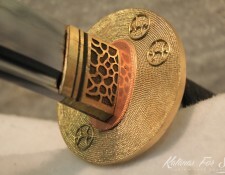 The fittings for the tsuba (hand guard) and scabbard are sometimes made of gold and silver. 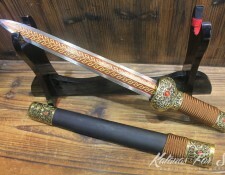 The hilt and scabbard are at times carved with ivory. 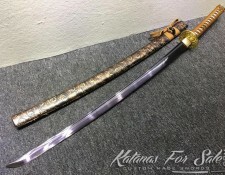 Master Swordsmiths like Masumane have to forge the blade in a way that makes the edge very sharp but, it will not break even during in a fierce duel. Before the blade is forged, Shinto priests are called to bless the beginning of the process. 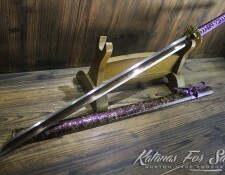 Even the swordsmith underwent a spiritual purification before he began to work on the sword. 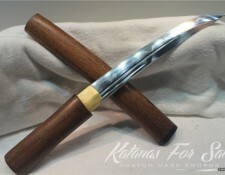 The swordsmith commits his soul and spirit into the forging and tempering of the steel. Before a samurai wields his sword he must not blink because to do so would give his opponent time to deal the mortal blow against him. 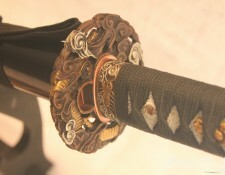 One of the famous swordsman comments that “the heart of the samurai is like a mirror, empty and clear”. 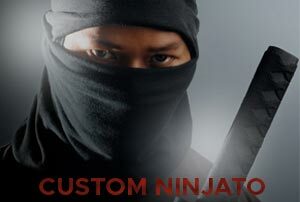 Once the samurai achieves this state of mind he is said to be prepared for intense concentration. His mind is clear of distractions and wielding the sword would become like second nature to him as breathing. He has the ability to draw his sword to kill his enemy.